Readers of Micscape may be familiar with the ink and scraperboard drawings of diatoms and radiolarians from my periodic illustrated articles. These actually constitute one facet of my artistic output; for the last seven years or so, my specialisation has been in botanical and natural history illustration. 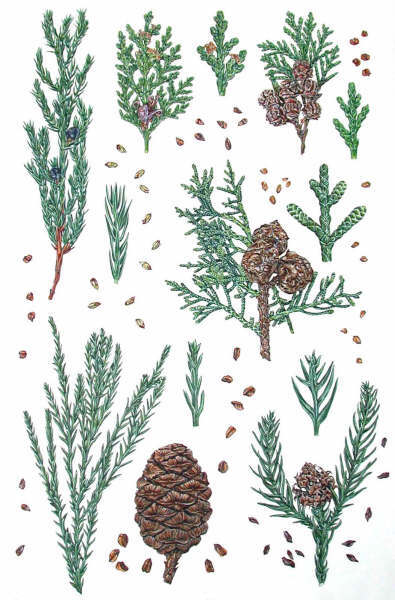 Born in 1974, I originally graduated in fashion and textiles, but am entirely self-taught as a botanical illustrator. Recently I completed work on an instruction book about botanical painting, titled Drawing And Painting Plants, to be published by A & C Black in October 2006. 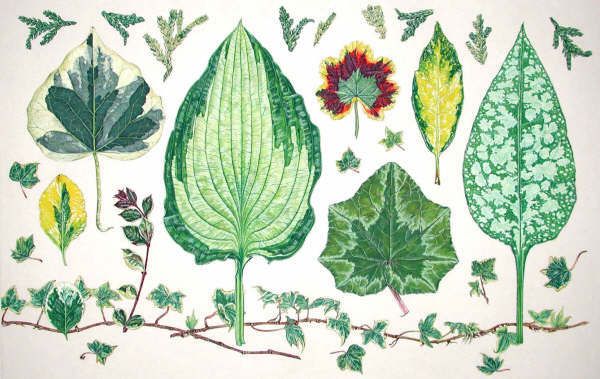 The book takes a novel approach in that not only painting and drawing methods, but techniques such as dissection, collection of plants, environmental studies, microscopic work and botanical nomenclature are all covered. 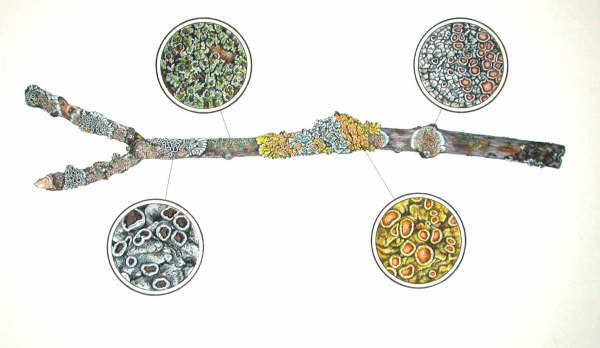 Students not only learn how to study and paint flowering plants, but the whole plant kingdom, including coniferous trees, fungi, ferns, mosses, seaweeds and lichens. This teaching technique derives from adult education classes I taught for several years at a local adult education centre in Somerset. For Micscape's 10th Anniversary edition, I have elected to display some of the paintings from the book for readers to enjoy. 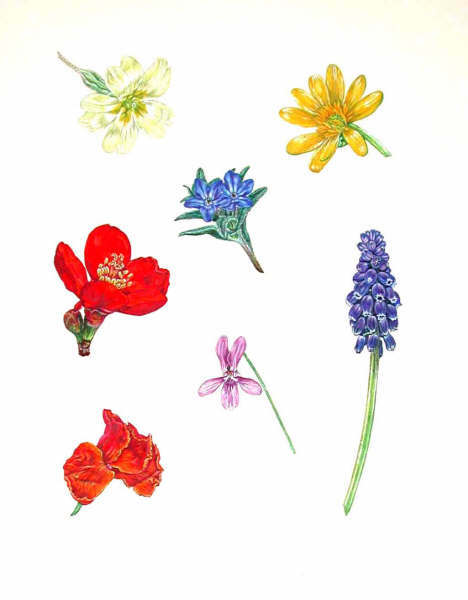 Coloured flowers: a painting originally made to illustrate how specific colours of paint can be matched to particular flowers. 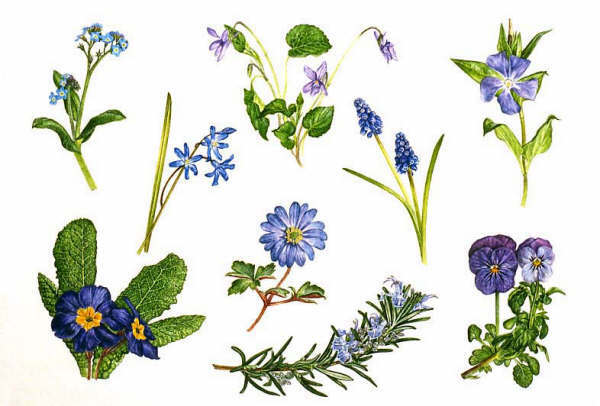 Blue Spring Flowers: includes forget-me-not, Scilla, violet, grape hyacinth, periwinkle, viola, rosemary, spring anemone, Primula species. 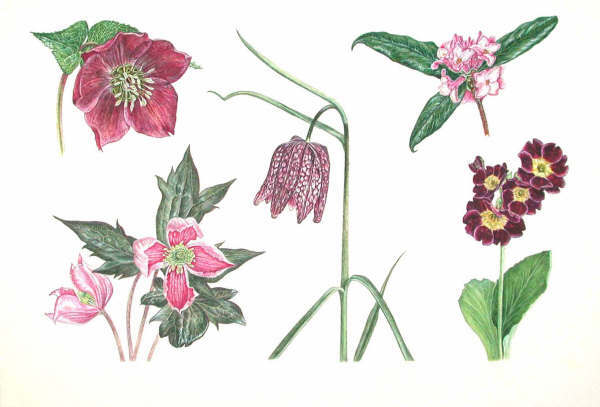 Red/Purple Spring Flowers: includes hellebore, clematis, snakeshead fritillary, Daphne, auricula. 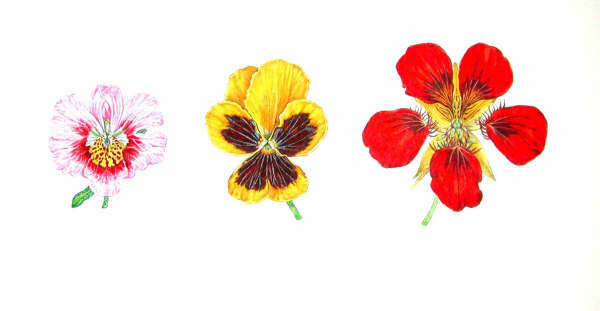 A painting made to show the different patterns, or honey guides, on a flower's petals that lead pollinators to the flower, in schizanthus, pansy and nasturtium. Sections through fruit to show different ways in which the ovary is divided (placentation): tomato, kiwi, passion fruit. 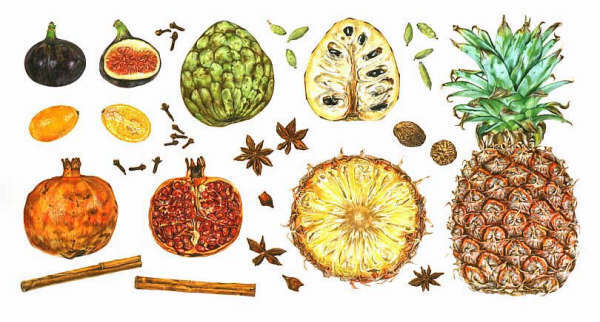 Tropical fruits and spices: fig, cherimoya, pineapple, pomegranate, kumquat, clove, cardamom, nutmeg, star anise, cinnamon. 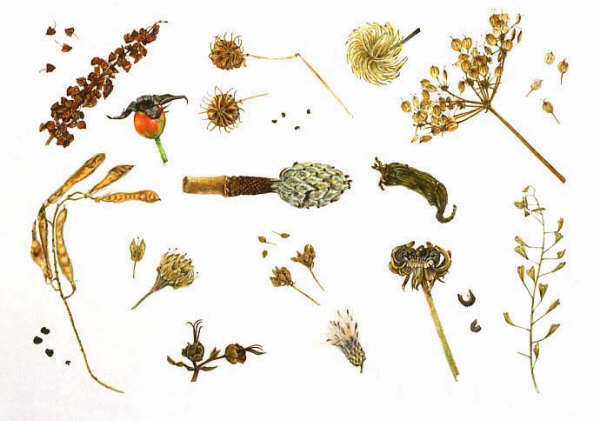 Seedheads, including those of dock, clematis, umbellifers, crucifers, wintersweet, magnolia, shepherd's purse, marigold, thistle, Hypericum, sweet pea. 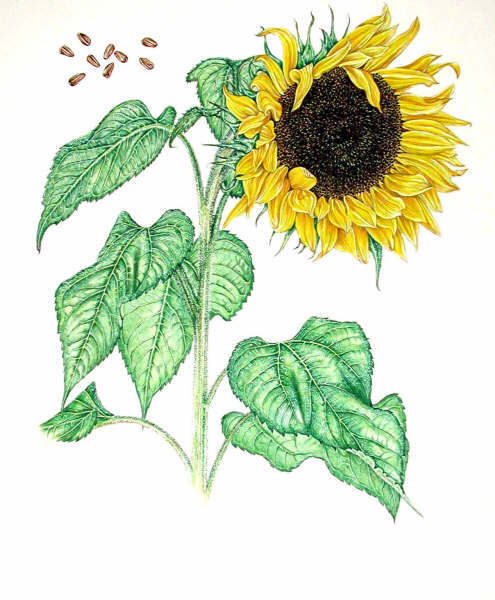 Development of monocotyledon and dicotyledon seeds as shown in sunflower and maize. 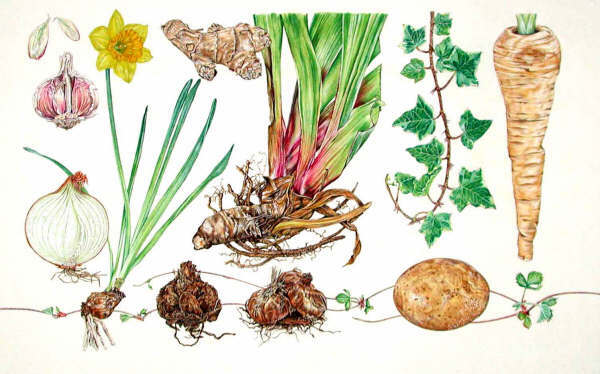 Different types of root: gladiolus (corm), lily (scaly bulb), daffodil (tunicate bulb), garlic (corm), ginger, iris (rhizome), ivy (adventitious root), parsnip (taproot), potato (stem tuber), strawberry (stolon). Variegated leaves: Euonymus, ivy, hosta, zonal geranium, Aucuba, Pulmonaria, cyclamen and variegated conifer Thujopsis. 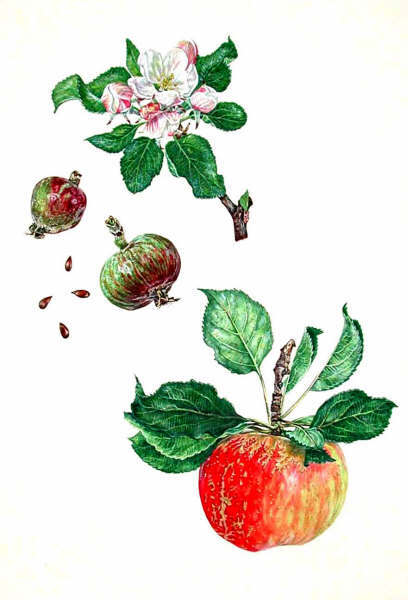 Study of apple "Discovery" through flowering and fruiting stage. 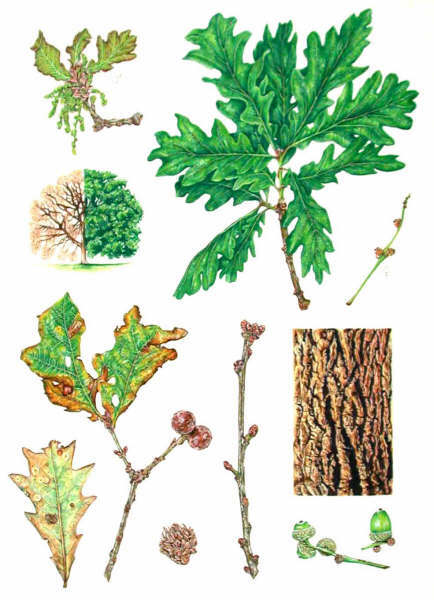 A comprehensive study of an oak, showing male and female catkins, foliage, bark, acorns, winter buds, autumn colour, the tree in summer and winter, and various galls. Rendering of tree shapes in gouache and pen-and-ink. Autumn colour, as shown in leaves from Westonbirt Arboretum. 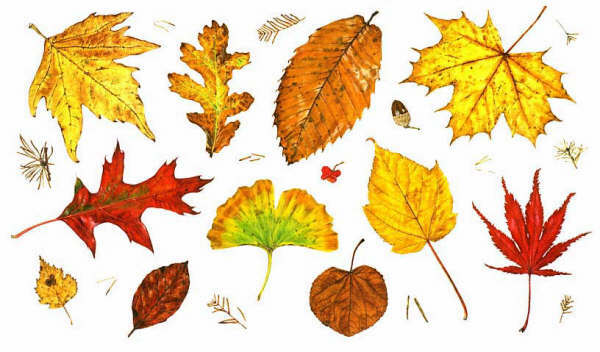 Illustrated are leaves of plane, 2 types of oak, 3 types of maple, sweet chestnut, katsura, beech, birch and ginkgo, with fragments of larch, a spindleberry and an acorn. 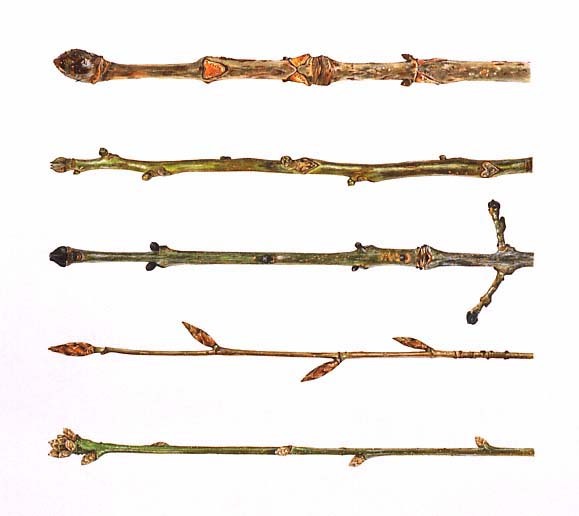 Winter Twigs 1 - Buds: horse chestnut, walnut, ash, beech, oak. 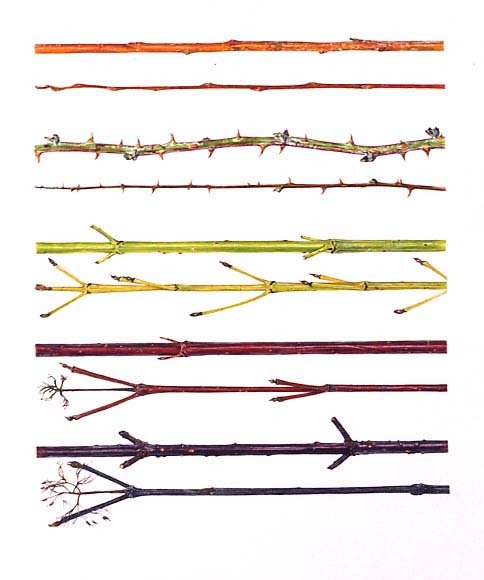 Winter Twigs 2 - Stems: willow, bramble, 3 types of dogwood. 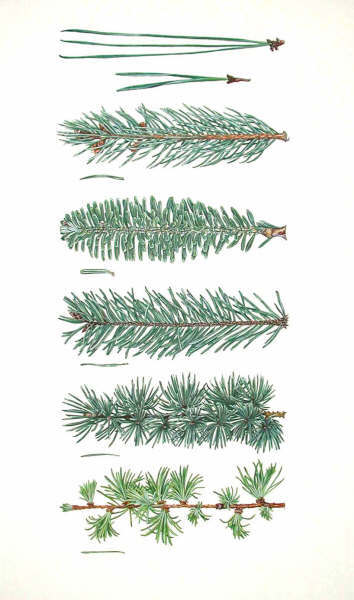 Needle-leaved conifers: 2- and 3-needle pines, spruce, fir, Douglas fir, cedar, larch. 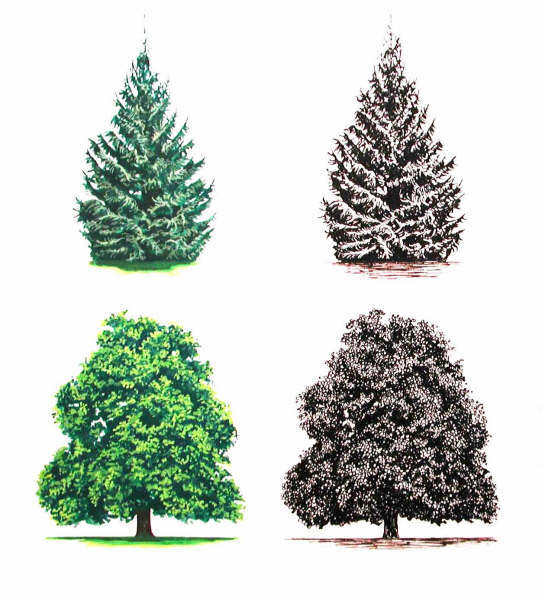 Scale-leaved conifers: juniper, thuja, Lawson cypress, cypress, cryptomeria, sequoiadendron. Illustrated with seeds and magnified shoot tips. 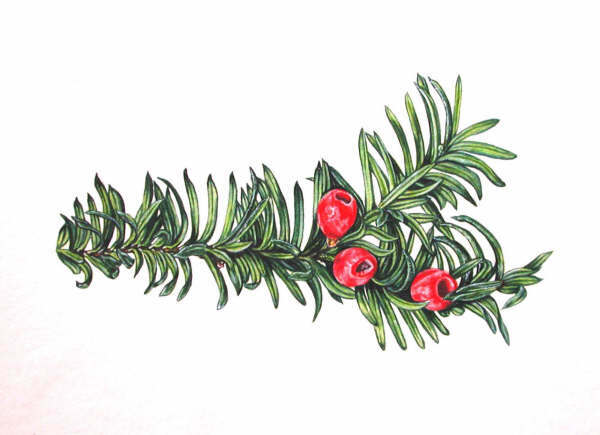 Yew, a conifer classed in its own category. 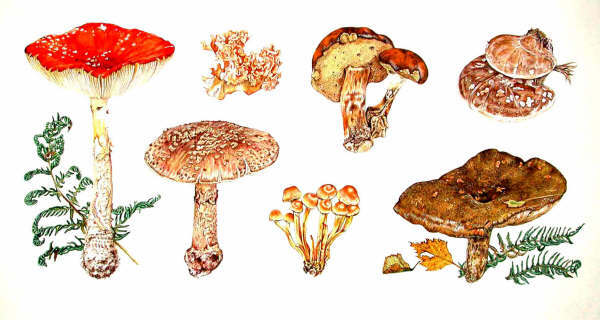 Fungi from a location on Exmoor, including: fly agaric, blusher, cauliflower fungus, a bolete, birch poplypore, Lactarius. 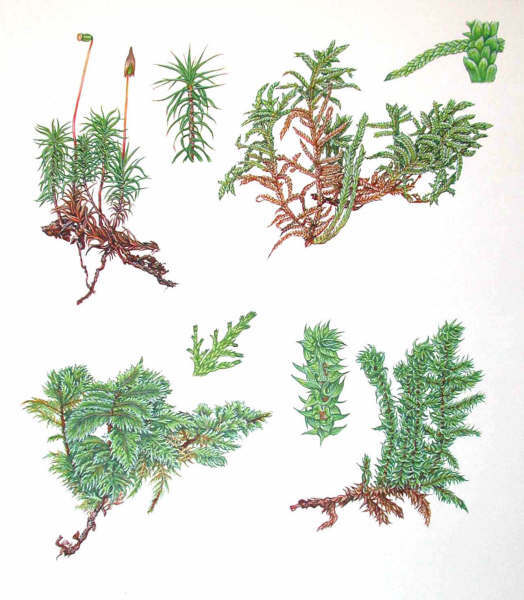 Different types of moss from an Exmoor location, including a species of Sphagnum (upper RH corner), and showing magnified views of the phyllids (specialized leaves). 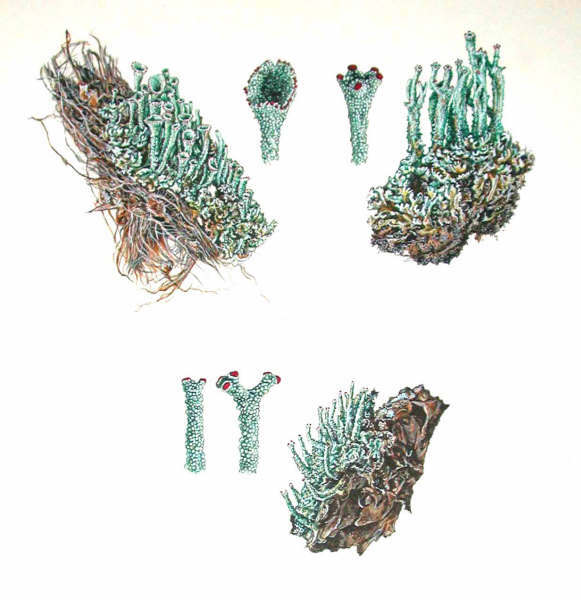 Cladonia lichens, the magnified views showing branching and spore-bearing structures. A painting showing how an environmental study can be made of a rare floral profile from a saltmarsh area and SSSI, using a combination of digital photographs and sketches. The drawings seen below are examples of the many (100+) ink drawings made to illustrate botanical nomenclature throughout the book. They illustrate flowers that are typical of particular plant families and that do not adhere to a very simple form. 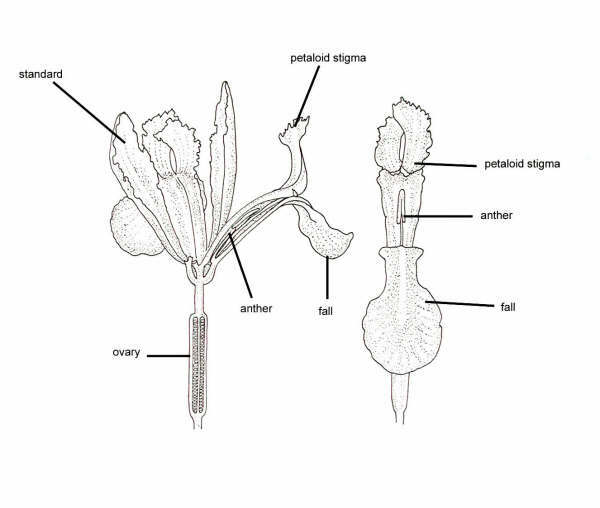 Iris half-flower and one-third flower, showing the three-fold symmetry and how the stigma and style are worked into the floral structure, deceptively appearing to be a petal! Passion flower. The male and female reproductive structures are borne on a column called the androgynophore, and surrounded by rows of corona filaments that form a platform for pollinators. Euphorbia. 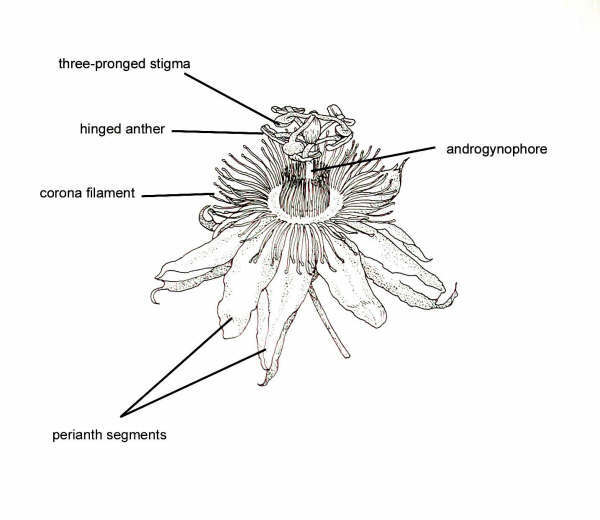 The flowers arise from the centre of a bract and are contained within a small cup, surrounded by nectar-secreting glands. 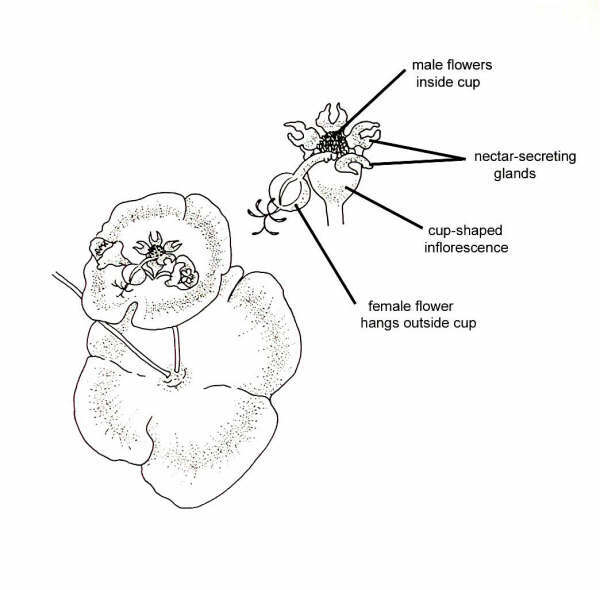 The male flowers are positioned inside the cup, whilst the female flower protrudes outside. This article gives a snapshot of the book's content; in addition to the paintings (approx. 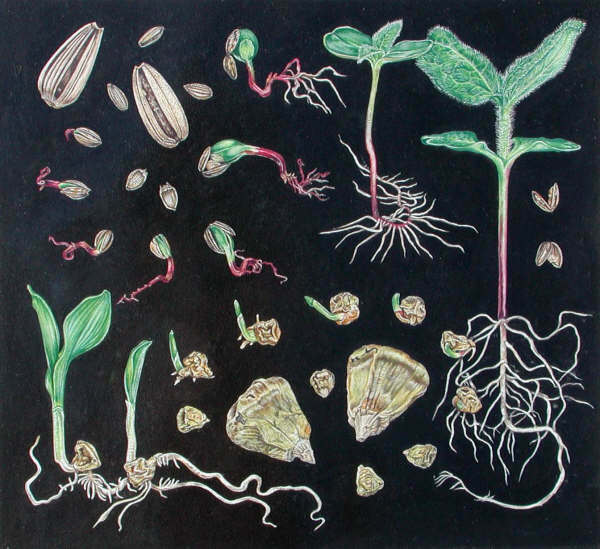 80), it will also feature numerous ink drawings (100+) illustrating botanical nomenclature, and photographs (100+) to show painting and scientific techniques. See my website for contact details, at www.queen-christina.com, which also shows some of my natural history illustration and design work. Images © Christina Brodie 2005. All rights reserved. Published in the November 2005 edition of Micscape Magazine.